In very large skillet, ( mine is 15 inches) pour in oil and set heat to medium high. Add onion, garlic, celery flakes, jalapeños and bell peppers. Let this start to sizzle and move vegetables to outer edges of pan. Then add chicken to the center of the skillet to cook and brown, about 15 minutes. Stirring and turning chicken pieces occasionally. Move chicken pieces to edges of skillet and add fish fillets to center of skillet, in a single layer. Sprinkle seasoning salt and paprika over meat and vegetables. Let this cook another 5- 10 minutes or until fish and chicken are cooked through. ( note fish will break up as it cooks). 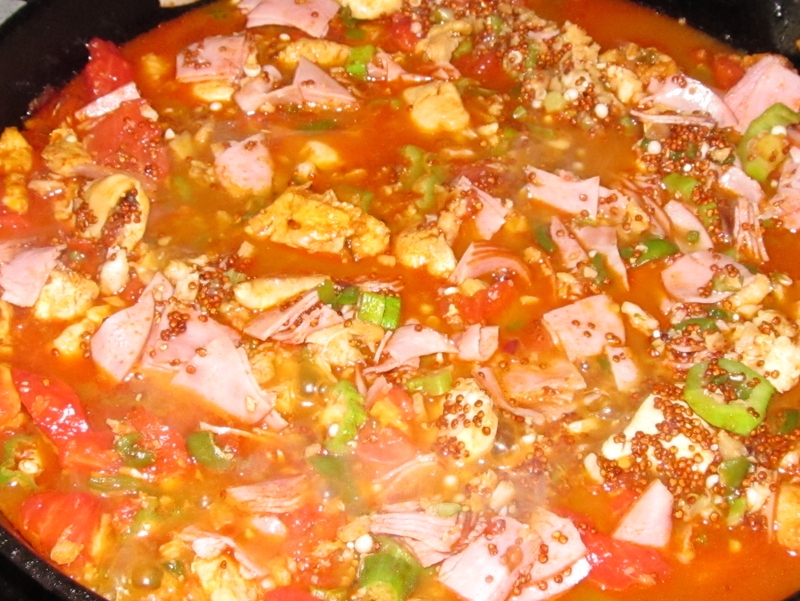 Then add ham and okra, and tomatoes. Stir in and cover for about 5 minutes. Then add shrimp, chicken broth and quinoa. Turn heat up until it starts to simmer, then turn heat down to medium. Cover and cook for another 15 minutes. Be sure to stir making sure quinoa is down in the liquid. Quinoa should be cooked by now, turn heat off and serve. We like to have this with hushpuppies or cornbread. Enjoy! There are many variations to this dish! Some add sausage, and cayenne pepper, others may add squash. Of course the original recipe uses rice. Just add anything that makes you happy! It’s Jambalaya!